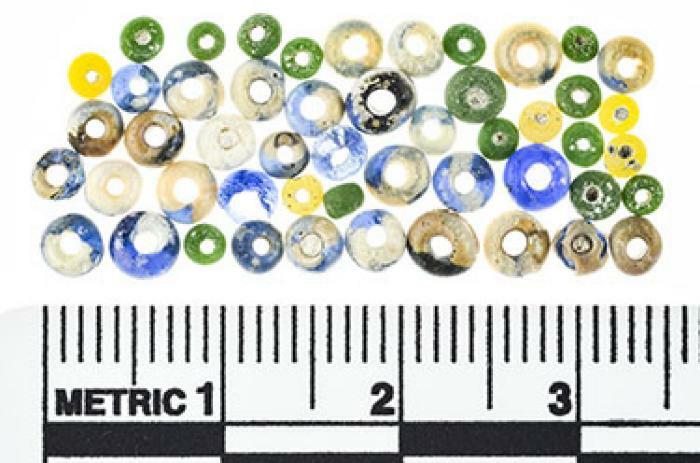 The tiny, colorful glass beads that were found on the wreck site of the Henrietta Marie were made in Europe. While readily available to the slave traders,they were rarer than gold in Africa and highly prized. Crowns and other ceremonial regalia were exquisitely decorated with beads like these. Originally, Arab traders brought beads to West Africa from the north. They sent them overland on an extended journey that was likely to involve several middle-men, driving up the price. When the Europeans arrived in their ships, they brought the same beads at a much less expensive rate, gaining instant access to African markets. Lading records in London’s Public Records Office itemize the cargo of the Henrietta Marie when it sailed in 1699.One of the first items listed is “282 lbs Great Bugles, valued at £18.15.6.” These were consigned to the voyage by Thomas Starke, the wealthiest and most influential of the Henrietta Marie’s consortium of investors. Starke was an experienced slave trader who was part owner of several other slaving vessels and owned five tobacco plantations in Virginia.Other investors consigned beadsto the cargo as well. The records state that altogether 1,758 pounds of them were shipped, of which only about ten ounces have been recovered, although many more remain on the ocean floor. Bugle beads are currently defined as tubular while most of those found on the site have been round, “seed beads.”Only a few long beads were found on the wreck site, but the term may have been used at the time to describe all the beads as a group. Three types of beads, in eight colors and seven sizes have been recovered. Three quarters of them are opaque green and most of these are between two and three millimeters in diameter. There are also clear and opaque blue beads as well as two colors of yellow beads and the rarer white-striped “gooseberry beads” that range from five millimeters to a centimeter in diameter. According to the records of the day and depending on fluctuations in the market at the time, a man could be traded for thirty-four-and-two-thirds to fifty-two pounds of beads, and a woman for twenty-six-and-two-thirds to forty pounds. However,the fact that so many seed beads were found at the wreck site suggests that either the market for beads was saturated when the Henrietta Marie arrived to trade or that the Africans were favoring only red beads at that time—none of which were found on the site but which the ship surely carried—or preferred tubular bugles and gooseberries, only a few of which have been found.